Nagore Beach is located in the Nagapattinam district of Tamil Nadu in the southern part of India. The Nagore beach is mostly famous for its beauty and for being a religious center. It is a very picturesque place and is regularly maintained by the municipal authorities for enhancing the pleasure of the tourists. Locals mostly enjoy this place for visiting during evening and mostly it is enjoyed by the picnickers. It is a great place to spend quality time with family members and friends. The beach offers many activities as well. One can stay engaged in the beach during day as well as evening time. One can visit the spiritual center located near the beach. The spiritual shrine is 500 years old Dargah of Meeran Sahib Abdul Qadir Shahul Hamid Badshah who is a Saint. He is the 23rd descendant of Prophet Muhammad. This is the place of Hindu and Muslim unity in India where people from all religions visits the shrine. The Dargah is a great place to establish faith in one’s religion. The 500 years old shrine is believed to attach to a tank called Peer Kulam. This tank contains water with curative properties. The rush at the Dargah can be felt during the Kandhoori Festival. Mostly the locals gather in the dargah during this festival. The tourists can also feel the spiritual spirit here during this festival. Apart from having a great spiritual center on it, the beach offers the tourists many water games and horse riding as well. As the beach remains less crowded, one can sit there to enjoy nature surrounding the beach. One can find horses on rent to ride on the beach. Horse riding on the beach offers a thrilling experience to the tourists. Nagore Beach Park is another location where the children and adult can enjoy alike. This beach park is the right medium to stay engaged on the beach. The beach park provides much entertainment to the visitors. 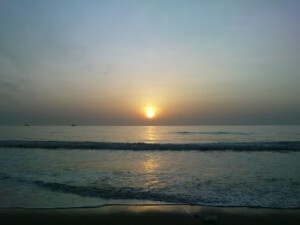 One can get complete satisfaction with the visit to the Nagore beach. Not only entertainment and amazing views are present, there are several food stalls situated in the beach where one gets excellent food also. The place is a great tourist spot and is mostly occupied by the foreigners. The beach is also renowned for the mouthwatering food also. Accommodation near Nagore beach is all cheaper. One will not get many luxury and star hotels near this beach. But staying can be enjoyed near the beach. One will get economic stay in Nagore. The best time to visit Nagore beach is October to March. One can reach Nagore beach by air, rail and road. One can get trains from Nagore to Nagapattinam, Thanjavur, Trichy and Chennai. The airport at Trichy is the nearest airport. Buses from Tamilnadu state Transport corporations connect Nagore to many cities in Tamilnadu. One can hire cabs and taxis to reach the beach.